Drain liquid from cans of beans into a measuring cup. Add the can of coconut milk to the measuring cup and add enough water to make 4 cups of liquid. Place the liquids, seasonings, and beans into pot and bring to a boil. Add rice and stir for one minute. Reduce heat to simmer. Put 2 slices of dehydrated jalapeno peppers on top of the water and cover tightly for 30 minutes. Let cooked rice cool. Place on parchment paper, or fine mesh screens in a single layer and dry at 125 degrees for 5-7 hours. Break up the rice and beans about half way. Put 1 cup of dehydrated rice into storage bag for each person and seal. Dehydrated Chicken - drain liquid from canned or pouch chicken. Break into small pieces and put of parchment paper or fine mesh screens. Dry at 155 degrees for 4-8 hours until dry and brittle. Bag and store in FREEZER. 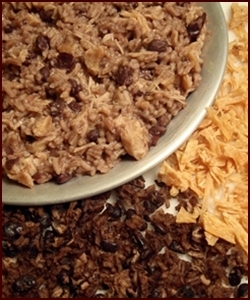 The night before trip, add ½ cup of dehydrated chicken from freezer to 1 cup of dehydrated rice mixture. Add approximately 1.5 cups of boiling water (start with less, add more if needed). Let sit for 10 minutes in cozy. Enjoy. If you prefer less heat, leave out the cayenne pepper and jalapeno. I tried this recipe and took the photo above. It was delicious and very filling. I used regular coconut milk instead of "lite" and Badia brand Jerk Seasoning, both of which I found in the ethnic foods section of my Publix Grocery Store. I used canned chicken which I dehydrated at 145 degrees. Thanks Squidbilly's Wife!